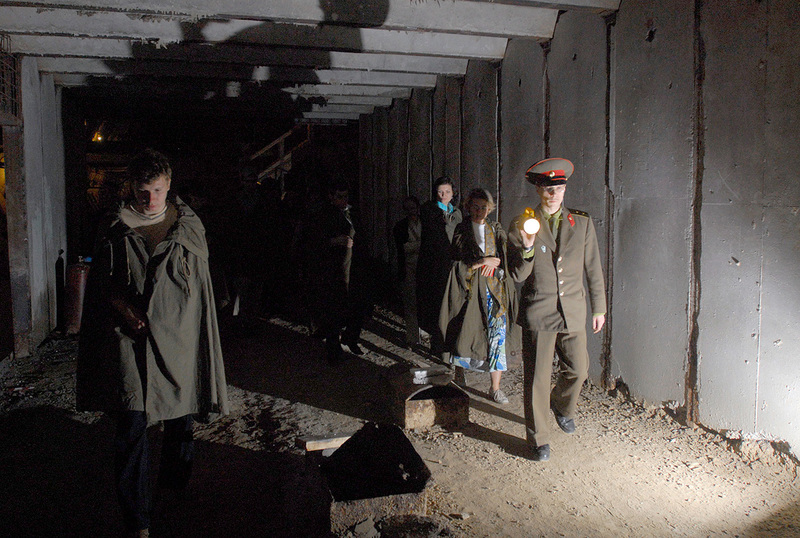 Bunker 42 is a Cold War Museum, located in the center of Moscow. You can tour the underground facility and learn about the nuclear confrontation between the Soviet Union and the U.S. It was built in the fifties to be the headquarters of the Long-Distance Air Forces. It’s located 60 meters below the surface and covers an area of 75,000 square feet. In the sixties, the bunker was equipped with life-support systems, a water supply, and enough food to support officers for a long time, but in the eighties its condition deteriorated. In 1995 it was declassified. The bunker’s main entrance shaft has an elevator and is protected by a six-meter thick concrete cap, hidden inside a fake 19th century house with blank windows. The cap was designed to protect the shaft from the wave of a nuclear explosion and can withstand a direct hit from an aerial bomb. How to get there: Moscow, 5th Kotelnichesky Lane, 11. Ticket office is open everyday from 10 a.m.-8p.m. Museum open 24 hours. Website. This museum in Novosibirsk (2,000 miles east of Moscow) is dedicated to funerals...if it sounds pretty morbid, it’s because it is. On show are a series of photos belonging to the so-called “post mortem” genre: Designer mourning clothes, death masks, statues, and monuments. There is also an impressive collection of unusual coffins. Nice! How to get there: Novosibirsk, Voskhod, Voentorgovskaya, 4/16. Open Tue-Fr 12 p.m.-7 p.m., Sat-Sun 11 a.m.-7 p.m. Website. The Museum of One Painting named after G.V. Myasnikov (it’s full name!) is a state museum located in Penza (400 miles south-east of Moscow). Founded in 1983, there’s no other museum like it in the world. There’s no permanent exhibition there. The only hall shows a solitary painting (usually an important work of art). Before visitors are able to see the artifact they watch a 45-minute film, describing the peculiarities of the exhibit, its history, and the biography of the painter. The museum used to show such masterpieces as “The Conquer of Snowy Town” by Vasily Surikov, “After the Battle” by Kuzma Petrov-Vodkin, “Portrait of a Young Woman” by Titian, and more. How to get there: Penza, Kirova Street, 11. Open every day except Thur 11 a.m.-6 p.m. To visit the museum, you should call or write by email. Website. On the second floor of a small house in the city of Barnaul (2,240 miles east of Moscow) hides a real treasure for all car fans (and carjackers). The museum dedicated to car theft - yes, you read it correctly - was opened in 2003 by the staff of the Barnaul city public rescue services, which deals with the evacuation of wrecked cars. The array of carjacking methods on show is incredibly diverse: There are not only steel rulers and spanners, but also bear traps! Local police presented the museum many interesting exhibits like fake car plates, fake driver's license, “code grabbers,” and radio signal jammers. How to get there: Barnaul, Anatoliya street, 130. Open every day 10 a.m.-7 p.m. Website. The Angara Icebreaker is one of the most unusual monuments in Irkutsk (3,240 miles east of Moscow). The oldest icebreaker in the world was launched in 1900. It was built in the shipyards of Sir W.G. Armstrong Whitworth & Co Ltd in Newcastle, England by order of the Committee for the Construction of the Siberian Railway. At the time it was being built, transportation in the Irkutsk area was mainly limited to ferries - which could only sail behind an icebreaker due to the frozen conditions. The Angara was in use up until the early sixties. In 1990 the ship was moored in a reservoir in the Gulf of Irkutsk and turned into a museum. How to get there: Irkutsk, Marshala Zhukova Street, 36a. Open every day 9 a.m.-9 p.m. Website. Do you know other ship-museums in Russia? The Ural town of Solikamsk (meaning "salt on the Kama River") located 1,000 miles east of Moscow, was known as the salt capital of Russia. It was founded in the 15th century, when the Kalinnikov merchant family established saltworks there. The local economy heavily depended on the mining of minerals. The only saltworks museum in the world is located in the old Ust-Borovaya saltworks, which operated from 1882 to 1972. It shows the process of producing salt throughout the ages. There were no windows in the mines and the thick smoke meant the workers couldn’t see each other at arm's length. The saltworks used the traditional evaporation technique and by the middle of the 20th century, it remained the only saltworks in Russia using this method. On Jan. 1, 1972 it was closed down and eventually transformed into the museum. How to get there: Solikamsk, Gazety Zvezda Street, 2. Open Tue-Sat 9 a.m.-5 p.m. Website. The NKVD Remand Prison Museum in Tomsk (3,618 km east of Moscow) is located in the basement of a former NKVD prison, in operation from 1923-1944. In the courtyard of the prison, now called the Garden of Remembrance, there’s a monument to all victims of repression. The museum includes a prison corridor, a chamber for prisoners, and the room where the investigators worked. Among the exhibits are investigation files, photo albums, and crafts made by prisoners while in the camps and exile. How to get there: Tomsk, Lenina Avenue, 44. Open Tue-Sat 10 a.m.-6 p.m. Website. Stalin’s terror: Should the names of NKVD executioners be made public?